Alexandria Ocasio-Cortez (born October 13, 1989) is an American political activist, educator, community organizer and politician. On June 26, 2018, Ocasio-Cortez won the Democratic primary in New York's 14th congressional district, defeating the incumbent, Democratic Caucus Chair Joseph Crowley. 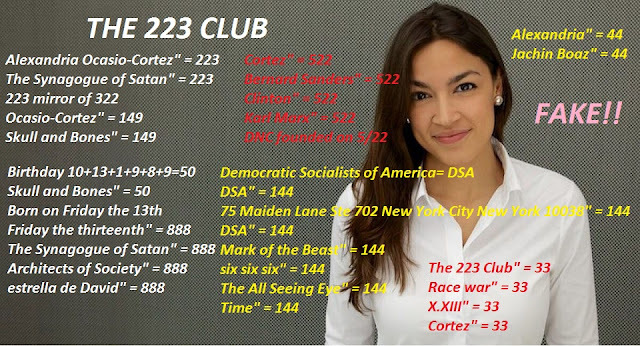 Ocasio-Cortez is a member of the Democratic Socialists of America. By the end of 2017, DSA membership had risen from over 6,000 to over 32,000, primarily due to the influx of youth in reaction to the presidency of Donald Trump, hence becoming by far not only the largest socialist organization in the United States in the 21st century, but also the largest socialist organization in the United States in over a century. As of June 2018, membership stood at 42,000 and the number of local chapters had increased from 40 to 181. The current median age of its membership is 33 (vis-à-vis 68 in 2013). In the off-year 2017 election, fifteen candidates who were members of the DSA were elected to office in thirteen states, most notably Lee Carter in the Virginia House of Delegates, adding to the twenty members already holding elected office nationwide. The party released a statement shortly after Ocasio-Cortez won her primary. This is the future of the DNC. Great Work Joan! Martin Luther King Jr was a Socialist. He belonged to the "Southern Christian Leadership Conference". "522" or 5/22, May 22nd is the 142nd day of the year, leaving "223" days remaining. These organizations deceive the masses into fighting and protesting for/against FAKE causes. Alexandria Ocasio-Cortez initials are A.O.C, an acronym for "Articles Of Confederation" (AOC). The Articles Of Confederation was an agreement between the "13" original states, formed on November 15, 1777(777). When Trump was sworn in he was 70 years, 7 months and 7 days old(777). The Duodecimal Value of "319" is "227" (227/722) "722" or 7/22 is the last day of Tisha B'Av in 2018. Oh wow great catch on MLK. You're so good at this. The earliest I traced to 522 number to was Karl Marx. It probably goes back further but I haven't found it yet. I'm pretty sure the 1888 number comes from B'nai B'rith they founded their Jerusalem temple in 1888. They're also 888, 214 and 1037. If you put their address in the calculator just as wikipedia has it, it comes up 888. I figure that for the Jersalem temple founding and "The synagogue of Satan" is 888 in the satanic cipher also. They're founding in DC was on "Friday the thirteenth"=888 and that connects to the Templars 1307 the 214 prime. Connects to Switzerland via 1214 the number on their currency. Also ..
"The country's name is on all the coins as Confoederatio Helvetica"
I'm predicting something big happening on either July 21st or 22nd. TishaB'av, Prince George's birthday and 14,000 days since the Georgia guidestones went up. TishaB'av is 14 in all Hebrew ciphers and so is David. It's all to perfect for something not to happen. Thank you! Your work is fascinating! The Fake Murders of Alison Parker(AliSON/MaSON) and Adam WARD(A WARD of the State) took place in Roanoke Virginia. Virginia, Maryland, GEORGIA and New York belong to the Articles of Confederation. Martin Luther King Jr. was born Michael King Jr., his Father attended a Southern Christian Leadership Conference in Berlin, Germany and upon his return he changed his son's name to Martin Luther. In honor of the German Roman Catholic Church Monk/Priest Martin Luther. Luther allegedly wrote"Ninety-five Theses of "1517". In the Forgotten Books of Eden, Cain murders his brother Abel when he was "17" yrs old and Abel was "15" yrs old "1517". This was the 1st Murder ever recorded and Cain and Abel was not their real names. The Holy Bible makes no mention of their ages (not sure why). Valentine's Day has a dual (duality) meaning( Love/Death & Murder), like most of the Pagan Holiday's. "269" the year Saint Valentine was beheaded. "1715"or 17/15 symbolizes the ages of Cain and Abel. Also, "1715" reduced is "14" and Cain and Abel represent the number "2", together is "214" or 2/14. After Cain killed his HALF brother, The Most High ask him where was his brother. He replied "Am I My Brother's Keeper?". I agree something is going to happen on 7/22 on the Gregorian Calendar or they might deceive us and use July 21st of 22nd on the Julian Calendar. July 22nd on the Julian Calendar is August 4th. August 4th is the birthday's of Barack Obama and Meghan Markle's, he will be "57" and she will be "37"(57 + 37 =94). The divisors of "94" sum to "144" and August 4th is the "216th" day of the year(666, 6x6x6=216). "Military False Flags=184(Jewish Ordinal)"184" is "84"